Donors with hearts of gold gave $160,000 to Circle of Care as the ministry for children and youths marked its golden anniversary with a gala event April 29. Even the keynote speech was pure gold. 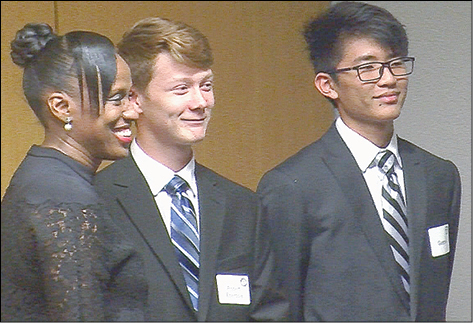 Olympic champion Jackie Joyner-Kersee told her story to some 450 guests at the National Cowboy & Western Heritage Museum in Oklahoma City. "I am living witness to the difference that can be made in the life of a child," she said. She was born to parents who were ages 14 and 16, and grew up in an impoverished area of St. Louis, Missouri. Her parents "didn’t have material things to give," but they gave the four children their love, and they "instilled in us that with God in our life, who can be against us." Yet others scorned childhood dreams. "You aren’t going to amount to anything" was a frequent comment. Age 9, she finished last in her first race. The child persisted. In 1976, at age 14, she watched women competing in the Olympics and set her sights on that. Her interest and skill in sports drew her in to a welcoming local community center. She scored a basketball scholarship to the University of California-Los Angeles. "God will look out for you," her mom had always said. Her mother died unexpectedly at age 37. "The whispers of my mother’s voice" pulled Joyner-Kersee back to her Olympic dreams. That "gave me the strength to be bold." Both she and her brother Al made the U.S.A. team for the 1984 games. He won gold in the triple jump, and she took silver in the heptathlon. 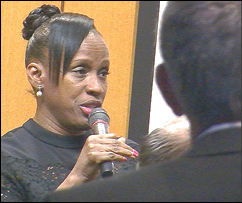 Joyner-Kersee still regrets missing that first chance at gold, although today she holds six Olympic medals, including gold ones, and the world record for heptathlon. An injury had caused her to doubt herself. "We’re all faced with crisis at different times," she summed up. "Sometimes we get lost. We’re not looking for a handout; we’re looking for a hand up. It’s your voice that becomes the voice for the voiceless. "That’s what you give each and every one of the young people. You give the gifts of life, a second chance, for a homeless mother, a child, not knowing where their next meal is coming from, let alone a roof over their heads." "You believe in them. It speaks volumes when you give of your treasures — your gifts, your time. It is because of you caring for them. The Circle of Care is what each and every one of you embodies." Oklahoma clergywoman Anna Marie George gave the prayer at the event. When she was a foster child, she said, she didn’t know about the United Methodist cross-and-flame emblem on the church van that picked up her and her siblings. "What I understood was here was a van to take us to church where people loved on us, cared about us, and helped us to feel protected and safe." Rev. George prayed, "We thank you, Lord, for the last 100 years they have answered the call" as the Circle of Care. "It's your voice that becomes the voice for the voiceless."